No one can suffer for all time. No one will spend all his days on this earth in suffering. Every action brings its own result, and one gets one's opportunities accordingly. I have compassion on the multitude, because they continue with me now three days, and have nothing to eat: and I will not send them away fasting, lest they faint in the way.  The Gospel of Matthew 15:32 (KJV). What man shall there be among you, that shall have one sheep, and if it fall into a pit on the sabbath day, will he not lay hold on it, and lift it out? How much then is a man better than a sheep? Wherefore it is lawful to do well on the sabbath days.  The Gospel of Matthew 12:11–12 (KJV), said to the Pharisees. 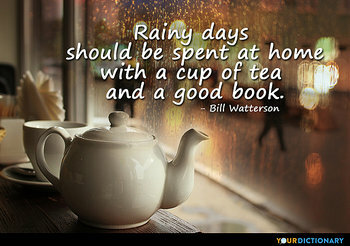 Rainy days should be spent at home with a cup of tea and a good book.  Bill Watterson, The Calvin and Hobbes Tenth Anniversary Book (1995). Teenage crush is like flu. If you find a remedy for it, it lasts for a couple of days. If you don't, it still lasts for a couple of days. May all the gods whom I settled in their sacred centers ask daily of Bêl and Nâbu that my days be long and may they intercede for my welfare. ... The people of Babylon blessed my kingship, and I settled all the lands in peaceful abodes. At bottom, the court's opinion is thus a rejection of the common sense of the American people, who have recognized a need to prevent corporations from undermining self-government since the founding, and who have fought against the distinctive corrupting potential of corporate electioneering since the days of Theodore Roosevelt. It is a strange time to repudiate that common sense. While American democracy is imperfect, few outside the majority of this court would have thought its flaws included a dearth of corporate money in politics. One solace yet remains for us who came Into this world in days when story lacked Severe research, that in our hearts we know How, for exciting youth's heroic flame, Assent is power, belief the soul of fact.  Memorials of a Tour in Italy (1837), IV ("story" refers to History). Everything an Indian does is in a circle, and that is because the power of the world always works in circles, and everything tries to be round. In the old days when we were a strong and happy people, all our power came to us from the sacred hoop of the nation, and so long as the hoop was unbroken the people flourished. A friend came over to the housea few days ago and read one of my poems.He came back today and asked to read thesame poem over again. After he finishedreading it, he said, "It makes me want to write poetry."  "Hey! This Is What It's All About"
Should we retain our national flag that conveys historical continuity from the days of the Cakobau government to the period of British Colonial rule, or is it time for a new one? Pontus, instituted among all people, as an addition or corollary of devotion towards God, that festival days and assemblies should be celebrated to them who had contended for the faith (that is, to lie martyrs ). I once sat on the rim of a mesa above the Rio Grande for three days and nights, trying to have a vision. I got hungry and saw God in the form of a beef pie. All days are nights to see till I see thee, and nights bright days when dreams do show thee me. Thou wast not born for death, immortal Bird! No hungry generations tread thee down; The voice I hear this passing night was heard In ancient days by emperor and clown: Perhaps the self-same song that found a path Through the sad heart of Ruth, when, sick for home, She stood in tears amid the alien corn; The same that oft-times hath Charm’d magic casements, opening on the foam Of perilous seas, in faery lands forlorn. I fled Him, down the nights and down the days; I fled Him, down the arches of the years; I fled Him, down the labyrinthine ways Of my own mind; and in the midst of tears I hid from Him, and under running laughter. One day of good preaching is no match for six days of inconsistent practice. God will never honor His church with complete success until it completely honors Him.  "On the Past and Future"
Six days shalt thou paddle and pack, but on the seventh thou shall wash thy socks. Just sitting back trying to recapture a little of the glory of... Well, the time slips away and leaves you with nothing, mister, but boring stories of Glory days - yeah, they'll pass you by, Glory days - in the wink of a young girl's eye. What shall I do with all the days and hours that must be counted ere I see thy face? How shall I charm the interval that lowers between this time and that sweet time of grace? Bombay is energetic, exuberant, sparkling, and has building stones of many kinds and colours ... on your dyspeptic days you are apt to find ... Bombay's [architecture] bumptious, even riotous. In your more genial moments you might apply the adjective ... 'vital'. Be just,--not like man's law, which seizes on one isolated fact, but like God's judging angel, whose clear, sad eye saw all the countless cankering days of this man's life, all the countless nights, when, sick with starving, his soul fainted in him, before it judged him for this night, the saddest of all.  Rebecca Harding Davis, "Life in the Iron-Mills", Atlantic Monthly (April, 1861).